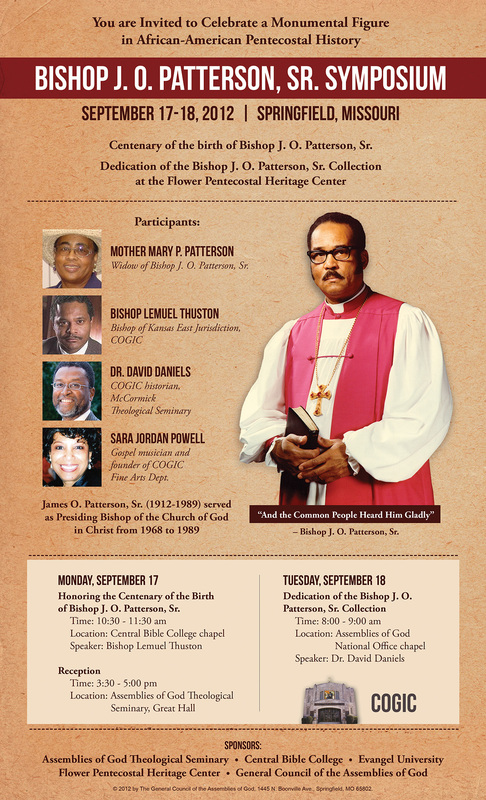 A symposium honoring the late Bishop J. O. Patterson, Sr., is scheduled to be held in Springfield, Missouri, September 17-18, 2012. James O. Patterson, Sr. (1912-1989) served as Presiding Bishop of the Church of God in Christ (COGIC), the largest Pentecostal denomination in the United States, from 1968 to 1989. The Bishop J. O. Patterson, Sr. Symposium will celebrate the centenary of Patterson’s birth and also will dedicate the Bishop J. O. Patterson, Sr. Collection. Patterson’s widow, Mother Mary P. Patterson, deposited Bishop Patterson’s personal papers at the Flower Pentecostal Heritage Center (FPHC). The FPHC, located in Springfield, Missouri, in the national offices of the Assemblies of God, is the largest Pentecostal archive and research center in the world. Honoring the Centenary of the Birth of Bishop J. O. Patterson, Sr. Mother Mary P. Patterson organized an earlier event, held on July 19 at the Tower Center in Memphis, commemorating the centenary of Bishop J. O. Patterson, Sr.’s birth. The event made the front page of the Memphis Commercial-Appeal. The Bishop J. O. Patterson, Sr. Collection is an important part of the expanding collection of African-American Pentecostal treasures at the Flower Pentecostal Heritage Center. These historical materials provide the basis for ongoing research and reflec­tion about our shared Pentecostal heri­tage and are attracting increasing num­bers of students and researchers to Springfield. The Patterson collection takes its place alongside other significant collections, including the original Azusa Street newspapers and Smith Wigglesworth’s original sermon notes. In the last year, ten major research collections were deposited at the FPHC, including collections assembled by these scholars, church leaders, and institutions: Pentecostal historians Grant Wacker, William W. Menzies, and Steve Durasoff; Hispanic-American Pentecostal pioneer H. C. Ball; German-American Pentecostal pioneer George H. Rueb; Bethany University; and African-American Oneness collector Robert James McGoings, Jr. The Bishop J. O. Patterson, Sr. Symposium is free and is open to the public. An oral history video interview is also scheduled to be recorded with symposium participants. Gospel music artist Sara Jordan Powell will provide sacred music for the two chapel services. For additional information about the symposium, contact the Flower Pentecostal Heritage Center by email (archives@ag.org) or toll free by telephone (877-840-5200). Tagged as Assemblies of God, Church of God in Christ, J. O. Patterson, Sr. This an wonder and outrageously fantastic opportunity to revisit the connection and unexplored opportunities for fellowship with Church of God In Christ and the Assemblies of God. God bless Mother Patterson for having the courage to advance this exchange and adding another foundation stone in this bridge of commonwealth Pentecostal union.